North Korea has announced it is proceeding with plans for a third nuclear test. In a statement carried by KCNA news agency, the top military body said the “high-level nuclear test” and more long-range rocket launches were aimed at its “arch-enemy”, the US. The statement gave no time-frame for the test. North Korea has conducted two nuclear tests, in 2006 and 2009. The move comes two days after a UN Security Council resolution condemned Pyongyang’s recent rocket launch. The Security Council also expanded sanctions against the communist country following its December launch, which was seen by the US and North Korea’s neighbors as a banned test of long-range missile technology. 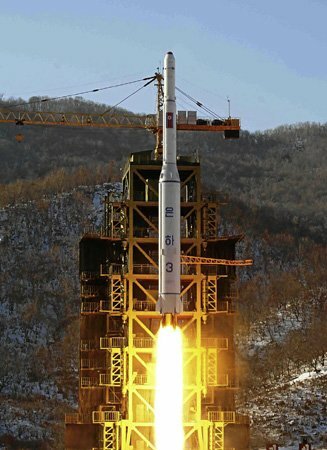 North Korea said the rocket was solely aimed at putting a satellite into space for peaceful purposes. The statement, which came from North Korea’s National Defence Commission, hit out at the resolution as “illegal”, before pledging a response. “We do not hide that the various satellites and long-range rockets we will continue to launch, as well as the high-level nuclear test we will proceed with, are aimed at our arch-enemy, the United States,” KCNA quoted it as saying. “Settling accounts with the US needs to be done with force, not with words,” it added. Recent reports from South Korean and US bodies which monitor North Korea’s nuclear test sites had said North Korea could be preparing for a third test. Earlier on Thursday, a South Korean defence ministry spokesman said it appeared that North Korea was “ready to conduct a nuclear test at anytime if its leadership decides to go ahead”. Regional neighbors, South Korea, China and Japan, and the US have urged it not to proceed. “We hope they don’t do it, we call on them not to do it. It will be a mistake and a missed opportunity if they were to do it,” said Glyn Davies, the US special envoy on North Korea policy who is currently visiting Seoul. A South Korean foreign ministry spokesman said Seoul deeply regretted the North Korean statement and “strongly” urged it not to go ahead. Both North Korea’s previous nuclear tests followed long-range rocket launches. If it were to go ahead, this would be the first nuclear test under Kim Jong-un, who took over the leadership after the death of his father Kim Jong-il in December 2011. There was no explanation in the statement of what “high-level” test might mean. Experts believe the two previous tests used plutonium as fissile material, but North Korea is also believed to have been working on a programme to produce highly-enriched uranium. It is thought that North Korea is not yet able to make a nuclear device small enough to mount on a long-range missile, although the US believes that is Pyongyang’s ultimate goal.